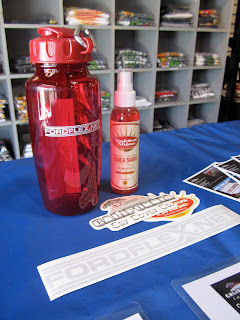 On Saturday we hosted a Ford Flex event in conjunction with FordFlex.Net. 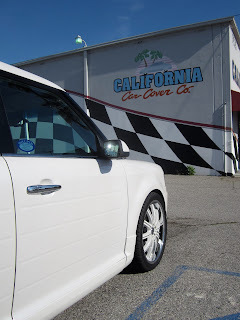 We had a few local Flex owners over at California Car Cover to show them all the products we offer for the vehicles and demonstrate some Golden Shine Car Care. Local author Dee Thompson brought out his custom wrapped Flex to showcase his literature and unique story. Special thanks goes out to the attendees and FordFlex.Net for donating stickers and water bottles for all event attendees. 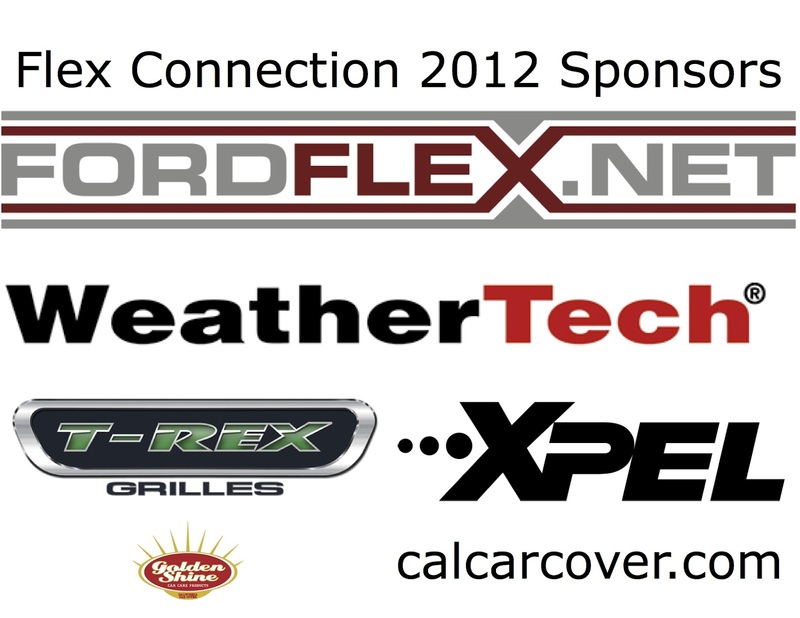 In addition, we would like to thank the event sponsors that donated some great door prizes for the event. 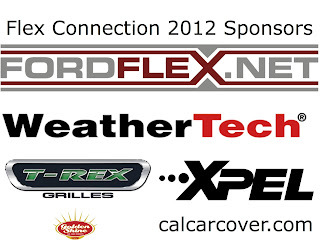 Thank you to Weathertech, T-Rex Grilles and XPEL. 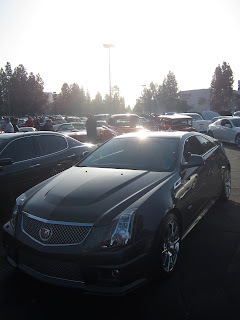 Sunday morning I was off to Super Car Sunday in Woodland Hills, Ca. The April marquee was Lamborghini, but there were plenty of other new and classic cars to check out. This photo is an example of why so many people cruise over to SCS on the last Sunday of the month. You can see a Mustang Boss 302, Ford GT, Bentley and a Chevy Nova all at one car show. The event draws a great variety of cars from all over the Los Angeles area. 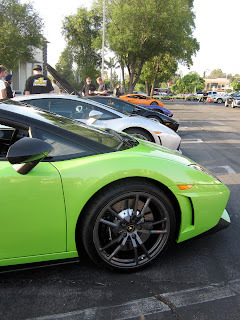 There was a wide assortment for newer Lamborghini vehicles in all sorts of colors. The cars drew a crowd of people all morning. There were quite a few late model Camaros at the show. 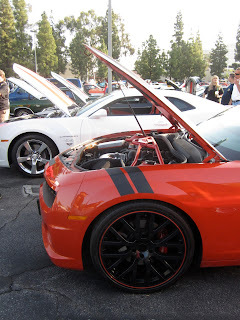 Hopefully they will attend our upcoming Camaro Car Show in June at California Car Cover. There is a Saleen S7 there in the middle of all the people. 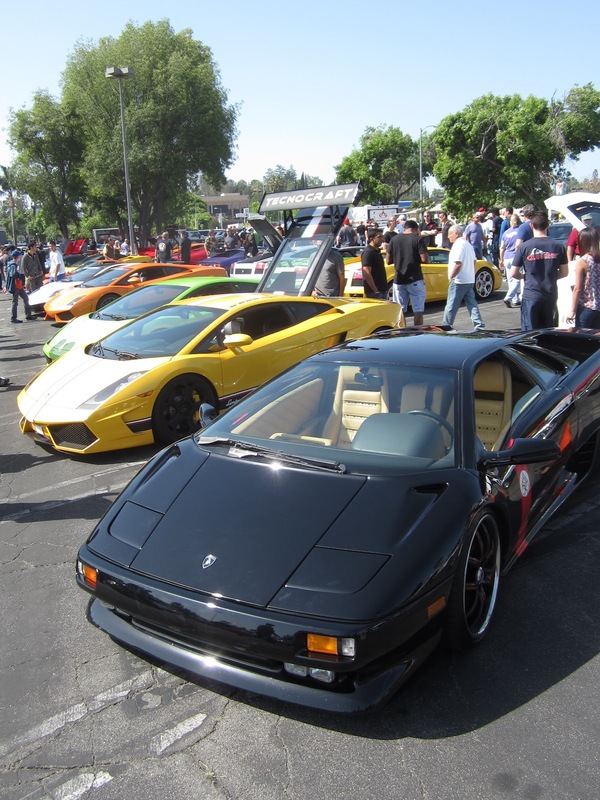 The Lamborghini was the marquee for the morning and the exotics attracted a lot of people. Big thanks to one of the local BMW Performance Clubs for promoting our upcoming European Show at California Car Cover. The show is going to be on Saturday, May 5th. The next Super Car Sunday will be held on Sunday, May 27th. You can view the upcoming marquee schedule on the SCS website. Where will I be next? Check back next week for highlights from our first ever European Car Show at California Car Cover and some other photo coverage from the Classic Chevy Club of Southern California Car Show and the Greystone Mansion Concours in Beverly Hills. 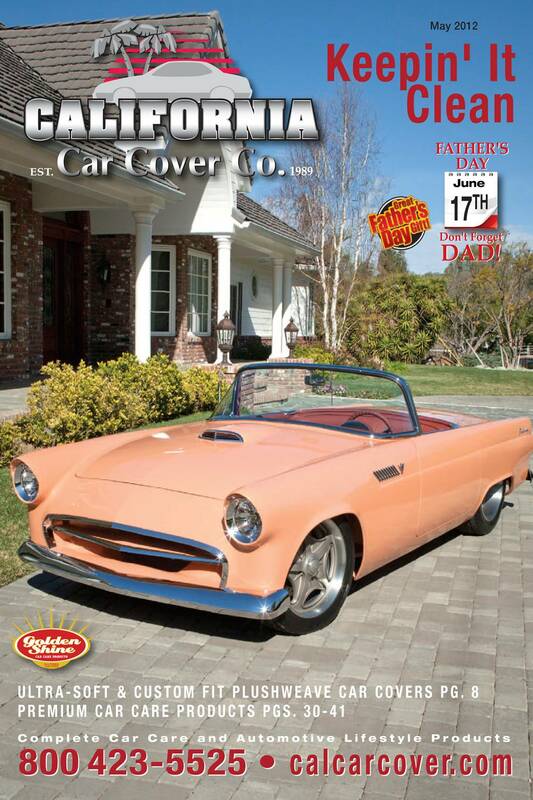 Our May 2012 catalog cover featured a custom 1955 Ford Thunderbird. 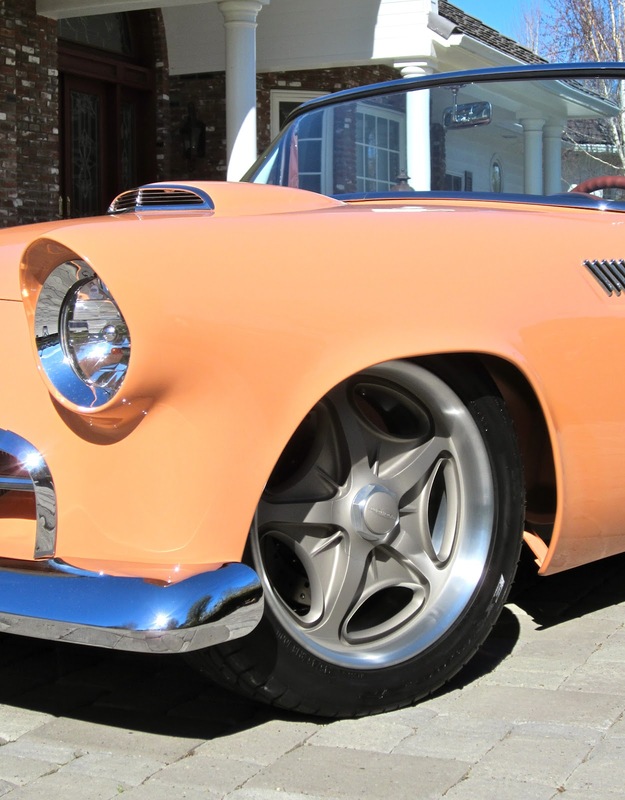 The Thunderbird was built by Tucker's Performance Center in Las Vegas, NV. You might recognized the name of that shop from a previous blog post. Rick Tucker, the owner of Tucker's Performance, gave us a tour of his facility while we were in Las Vegas for an automotive event. 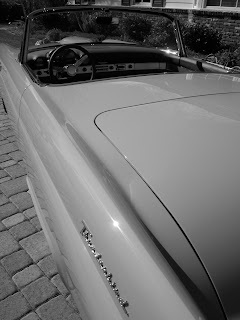 On that tour we spotted this Thunderbird. The Thunderbird was in its final stages of completion when we visited the shop. 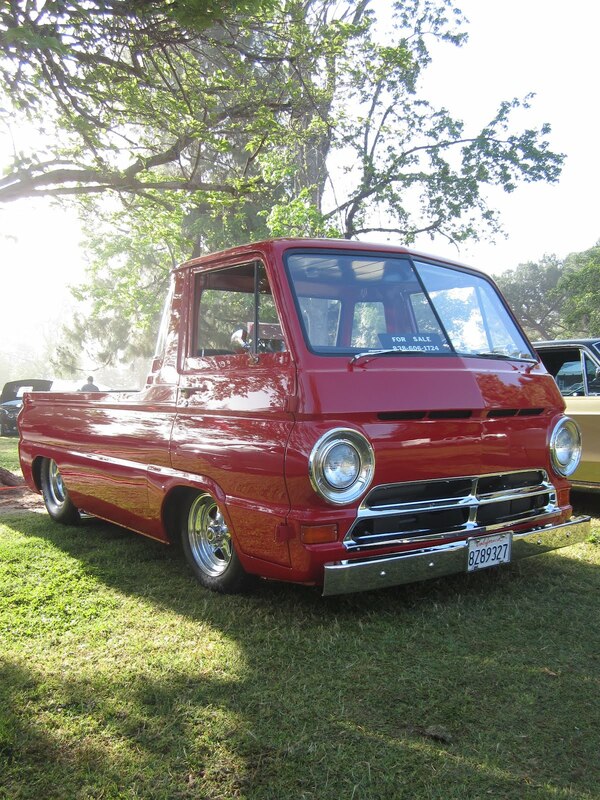 It was to unveiled at this year's Grand National Roadster Show in Pomona, Ca. 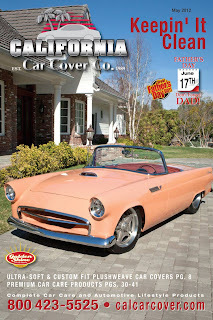 After the show, Rick brought the vehicle out to our photo shoot so we could feature it on our May catalog cover. 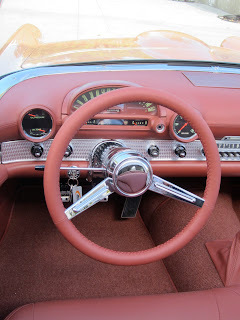 The Thunderbird features many custom touches. At first glance the T-Bird looks close to stock except for the frenched headlights and shaved door handles. 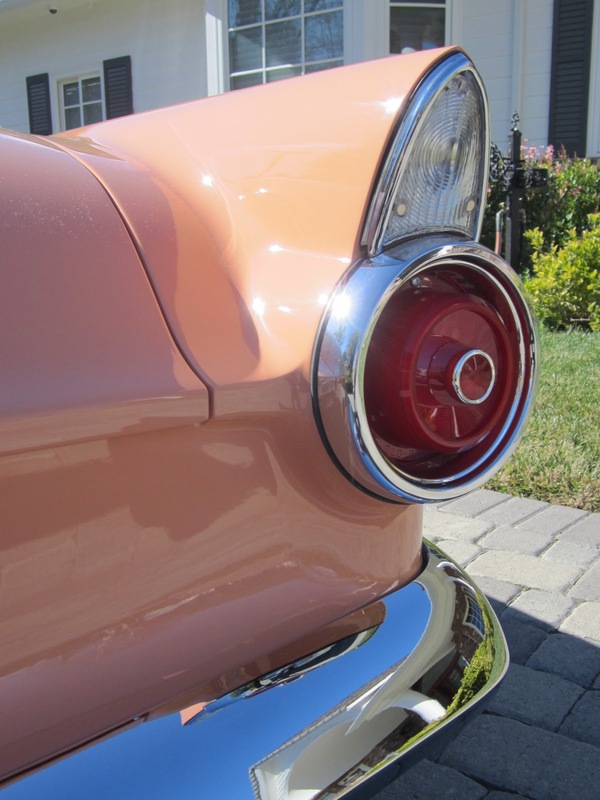 After a while of looking over the car you'll notice the custom grille, shaved parking lamps and wipers, extended quarter panels and raked rear fins. The car also features custom rear wheel openings and shaved and tucked bumpers. The custom interior and trunk trim was completed by Gabe's Custom Interiors. The vehicle has a smoothed firewall and custom floor. 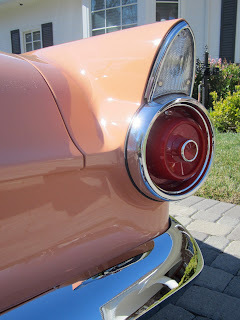 The Thunderbird is painted in a Coral Sand finish. All body and paint work was completed by the crew at Tucker's Performance. Under the hood is an all aluminum 452 Ford engine. The car sits on a modified Art Morrison Max G frame. In case you did not receive one in the mail, here is what the May 2012 catalog cover looks like. Thank you to car owner Al Hummel for letting us photograph the vehicle and to Rick Tucker and everyone at Tucker's Performance for bringing the car out to the photo shoot. For more information on Rick's shop, please visit their website. 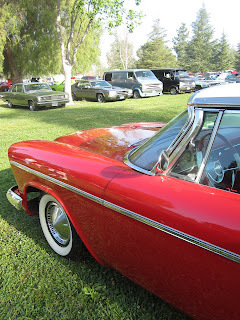 The Mopar Spring Fling XXVI was held at Woodley Park in Van Nuys, Ca this past weekend. 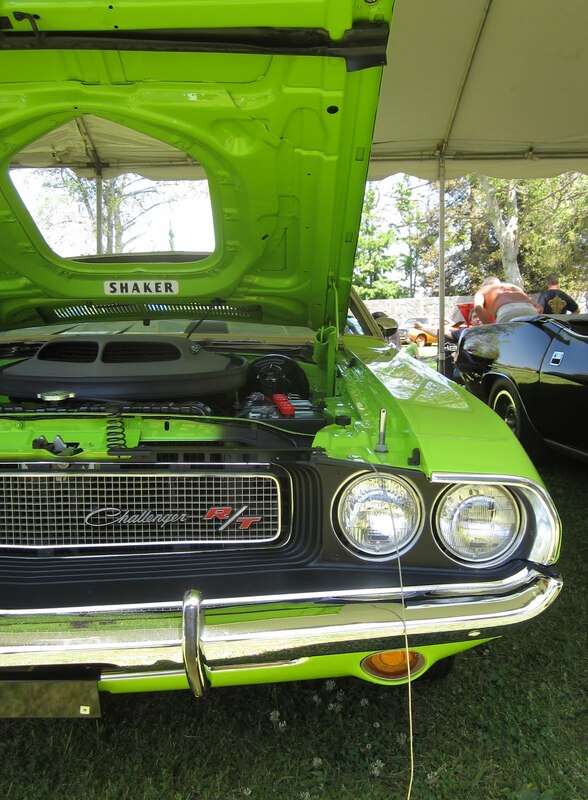 The two day show attracts Mopar enthusiasts from all over the globe. The event features quite a few days worth of activities including cruise nights, track days and a car show. California Car Cover was on hand and has been a supporter of the show for a number of years. Early Saturday morning I headed over to the park to setup and talk car care. The main attraction early Saturday is the parts exchange. 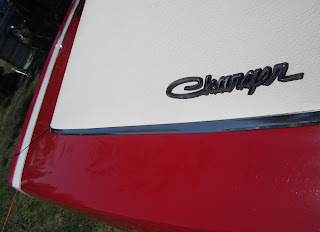 Nearly 200 swappers set up at the park to show off their Chrysler, Dodge and Plymouth parts and accessories. If you are working on a Mopar and need some parts this is the place to be. Starting at 5am this a line down the street of enthusiasts with truck beds filled with parts for muscle cars ready to swap. After the booth was setup I walked around to check out some of the cars that were on display. 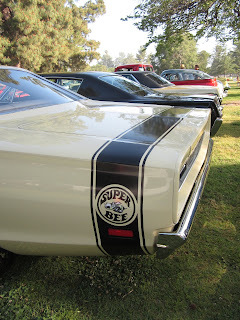 Well over 300 Mopar vehicles were there on Saturday. 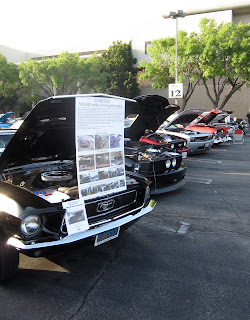 The club that hosts the event, Chrysler Performance West, does a great job of bringing in enthusiasts from all over the country. The club hosts two events a year, this show, and the Fall Fling. You can obtain more information about their events on their website. Row after row of Super Bees, Challengers, 'Cudas, and Darts filled the park. Though the show featured a lot of muscle cars, there were plenty of Chrysler and Plymouth vehicles from the '40s until today at the show. Classic Plymouth in the parts exchange. 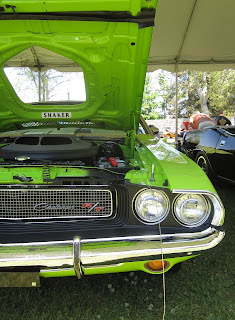 There were also a lot of the newer Mopar muscle cars on display, like this pair of newer Dodge Challengers. For more information on the Fall Fling please visit the CPW website. Want to know where the CCC Crew or I will be next? Visit our website. Next weekend, you can find the California Car Cover sales staff at the NSRA Event in Bakersfield, Ca, plus we will be hosting our Ford Flex event at our store in Chatsworth, Ca.